In the comments on the last post, Mom asked a good question. What do the kanji in the various names we're considering actually mean? Also, I've finally hit the halfway mark, 20 weeks down, 20 weeks to go. I'll be going to the temple with Sho-chan and his mother this weekend to get my special pregnancy belt at the safe-delivery temple, Nakayama-dera. I'll post pics next week! 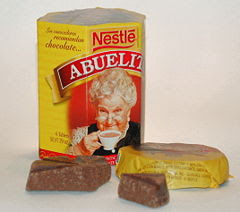 My student Shouta did a short homestay in California over the winter break and he gave me the above Abuelita (Little granny) chocolate drink as a souvenir. It's apparently very popular in Mexico, and after trying it I have to say it's quite yummy. I can't remember ever seeing it in the Mexican section at the supermarket, but if you ever come across it give it a try; it's creamy and lightly spicy. As for the baby, we went for the 20 week check up today, and got the good news that the baby is healthy, energetic and growing at the right pace. Unfortunately he/she did not want to cooperate and give us a clear shot of his/her crocthital area, so we'll have to wait until next month's check-up to see if it's a boy or a girl. Also, regarding names, the boy's name is decided; it's 麟太朗 (Rintarou). But we still have a few candidates for the girls name including: 玲奈 (Leina), 絵里花 (Erika), 純奈 (Junna) and the new contender 柚香 (Yuzuka).